At our Citadel office, we offer a complete set of general dentist services for routine dental care. These dental services include teeth cleaning, exams, x rays; fillings, dental crowns, and implants; root canals and tooth extractions. We explain and show everything to our patients, and believe every patient should be 100% informed as to the condition of their teeth and gums. Dental X-rays have come a long way. Today's dental X-rays are safer, faster, more comfortable and more informative than the X-rays of years past. Digital X-rays, one of the latest and most advanced dental technologies, produce high-quality images of your teeth that can be viewed instantly by you and your dentist on a LCD monitor. Digital X-rays reduce radiation by up to 90% and provide exceptional diagnostic information to ensure that potential problems are caught in their earliest stages. Intraoral photography is another alternative to traditional dental X-rays. With intraoral photography, problems such as cavities, fractures and discolorations in the teeth are captured through clear and sharp photographic images that are taken with a 35mm or digital camera. Our family dentists have a gentle touch, and we offer sedation dentistry as an option for those who prefer it. When fillings are required, we try to make the process as painless and quick as possible. We offer composite and porcelain for filling material, to blend in with the natural color of your teeth. Dental crowns require precision as well as an artistic touch. The fit must be correct to preserve and maintain the bite, and they need to blend in with the surrounding teeth with regard to shape, contour and color. Our family dentists are experts in designing beautiful and functional crowns to keep your bite perfect. We also offer specialized crowns; visit our cosmetic dentistry page for more information. Red, swollen gums are a red flag for one thing: gum disease. If you have the symptoms, you're not alone. More than 80% of adults have some form of gum disease. Fortunately, there are many effective and pain-free gum disease treatments. For gingivitis, the mildest form of gum disease, treatment typically involves a thorough dental cleaning, followed by daily brushing and flossing. Advanced gum disease, also known as periodontal disease, requires scaling and root planing to remove stubborn deposits below the gum line. Laser gum surgery, a new alternative to scaling and root planing, uses beams of high-speed light to remove plaque and tartar buildup. The phrase “root canals” engenders fear among most patients. However, the root canal process has changed greatly in the last decade due to diagnostic tools and technologies. Procedures now take less time, and they are quite painless. The family dentists at Mission Dental are qualified to do root canals, and have the right technology to make this a pain-free experience. Sometimes teeth need to be extracted, due to decay, injury, or in preparation for orthodontia. 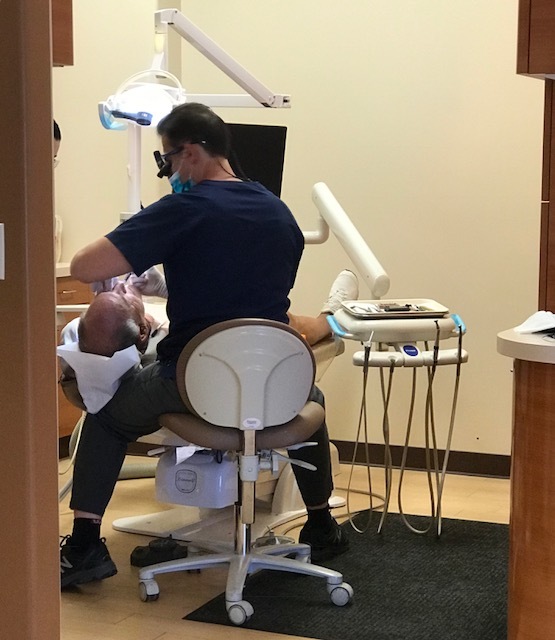 Mission Dental’s family dentists have the specialized training required to do tooth extraction, and take the time to make the patient feel at ease not only during the procedure, but also afterward. It’s a little unsettling to suddenly have a tooth removed from your mouth, but our dentists will answer all of your questions about what happens after that, and will develop a plan with you for putting your smile back together again. Conscious IV sedation enables a patient to remain awake, placing them into a state of deep relaxation. This differs from General Anesthesia, where the patient is completely unconscious. The patient is still able to communicate and talk during treatment, but will quickly recover and remember very little of the appointment afterwards. Quite a few dental offices offer, “sleep Dentistry”. This is when pills are given to a patient to fall asleep. Our office prefers to give our patients the safer and more reliable option of “Conscious IV Sedation”. When pills are taken, the dentist is unable to adjust the dosage if more sedation is required. However, IV sedation can be administered throughout the appointment. This keeps the patient comfortable at all times. Also, the patient can go back to normal in minutes by administering reversal agents, if necessary. Not only can fearful patients benefit from IV sedation, but anyone who plans to have a longer procedure and likes to remain relaxed and comfortable. -Have a general fear of dentistry? -Have a fear of needles? -Hate the smell and noise of the dental office? -Get numb with great difficulty? -Have a strong gag reflex? -Want to complete multiple procedures in 1 visit? If you answered yes to any of these questions, Conscious IV sedation may be the solution for you.